Here comes your basic curry stir-fry recipe. This meal packs curry goodness, crisp broccoli, cashew crunchiness and mie noodles, resulting in a fast dinner thrown into your wok. thai curry powder, 3 tsp. 1. Heat the canola oil in a wok. Add the garlic and ginger and sauté for a minute or two. 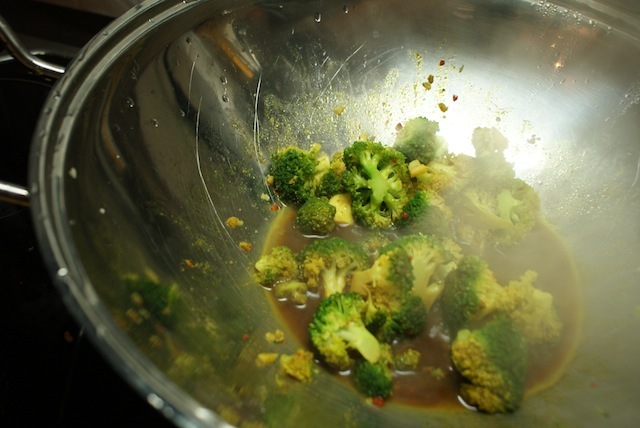 Then add the spices (curry and thai curry) along with the broccoli. Sauté for another 2-3 minutes, on medium heat, careful not to burn anything. Then add water, soy sauce, chili, salt and cayenne pepper. Put the lid on the wok (if you happen to have a wok with a lid, otherwise just leave it open on low heat) and let simmer for 5-10 minutes, until the broccoli is tender. 2. Meanwhile boil water for the noodles, throw them in once it’s boiling, put the lid on and set aside for about 5 minutes. The noodles should be done by then, and you can gently mix them with a fork. 3. Drain the pasta and add to the wok along with the cashew nuts, stir well, and taste for salt and pepper. Done!